Show everybody your pet is 420 friendly with this laser engraved pet id tag. The tag is made of high grade anodized aluminum with smooth edges. The leaves of the marijuana leaf have been rounded of sort so as to dull down and sharp edged while maintaining its striking recognizable appearance. Each tag comes with a key ring just as shown in the picture. Up to three lines of laser engraving come with this product. When ordering simply input a comment in the notes section detailing what you would like us to engrave on your tag! 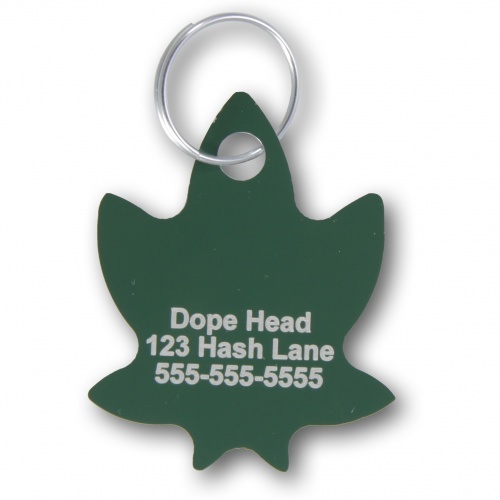 Do you own Marijuana Leaf Pet I.D. Collar Tag ENGRAVEDPETIDTAGGREENMARIJUANA? Tell us about it! Have a question? Ask!